Wearing an oil-stained florescent jacket, Ravie Sawh stood before a group of 50 job seekers and their supporters at Metro Transit's Overhaul Base last week. 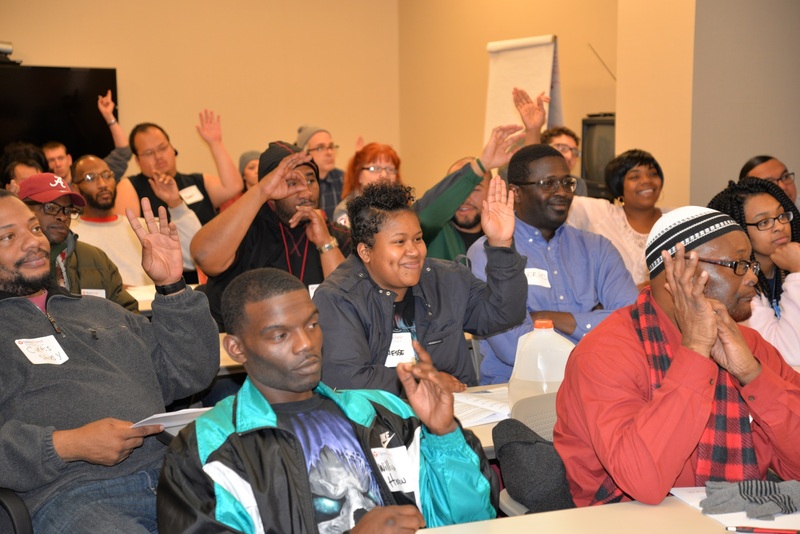 The group was assembled to hear what their futures could look like as the newest participants in the Metro Transit Technician Training program and, eventually, as full-time mechanic-technicians at the agency. Sawh was among the first individuals to participate in the MTT training program, which combines personal development, on-the-job training and support toward earning a two-year associates degree. Two years after starting, he and a dozen others from that first group are working as full-time Bus Maintenance interns and looking forward to graduating from Hennepin Technical College next spring. A second group of MTT participants being guided toward careers in Rail Maintenance are also working as full-time interns after starting classes at Hennepin Technical College this fall. Now at Heywood Garage, Sawh has already cast his gaze well past graduation: He wants to retire from Metro Transit after 30 or more years of service. The new MTT participants welcomed last week were encouraged to start envisioning a similar future for themselves, despite the difficult road ahead. Many of the participants have little or no mechanical experience and will have to juggle classes, second- and third-shift work, tutoring and other responsibilities to reach the finish line. The Office of Equal Opportunity is leading the program with support from Bus Maintenance and the Amalgamated Transit Union Local 1005. Several technicians will be tapped to serve as mentors. Minneapolis-based non-profit Twin Cities R!SE is also a key partner. The participants’ first step is to finish 12 personal empowerment classes offered by the organization. A group of 20 participants who finish those classes and meet other criteria will be invited to move forward to the program’s next phases, including custom training, a full-time paid internship and support toward earning an associates degree. Successful participants starting this month will be eligible to apply for full-time technician roles in late 2020. Full-time technicians now start at around $27 an hour, a wage many at the Overhaul Base last week said would be life-changing. Thomas Scott, who is overseeing the program on behalf of the Office of Equal Opportunity, said the prospect of a good-paying career should be just a part of the motivation. More than 250 people applied for the program. “Remember how many people wanted this opportunity,” Scott told the group. Brian Funk, Deputy Chief of Operations-Bus, said the program comes at an opportune time for the agency. Retirements and system expansion are creating more openings while fewer young people are pursuing skilled trades careers. The program also supports the agency’s equity and diversity goals: Nearly 90 percent of the participants in the new group are people of color. There are nine women.